Although the greater Phoenix area sprawls out for many, many miles, the basic grid of the Phoenix city system is contained within an area that goes from the Agua Fria River to Scottsdale Road, and from Bell Road to Baseline Road. The baseline for the east-west streets is, appropriately enough, named Baseline Road. From there, at 1-mile increments, are variously named streets which march up to Bell Road. The north-south streets (or avenues as the case may be) start at Central and are named Streets as they march east towards Scottsdale (which is 72nd Street) and Avenues as they march towards the Agua Fria River (which is about 91st Avenue). To understand the grid better, you have to realize that, except for in the area that is now downtown, the main streets existed long before the smaller streets were filled in. So the road that took you to the Bell farm, for example, was there long before any other little streets existed near it. The same with the road to the Thomas farm, or the Osborn farm. And as the city filled in, streets had to accommodate existing main streets that may or may not have been at a consistent distance from each other. That's why there are some small inconsistencies. But overall, it fits well. 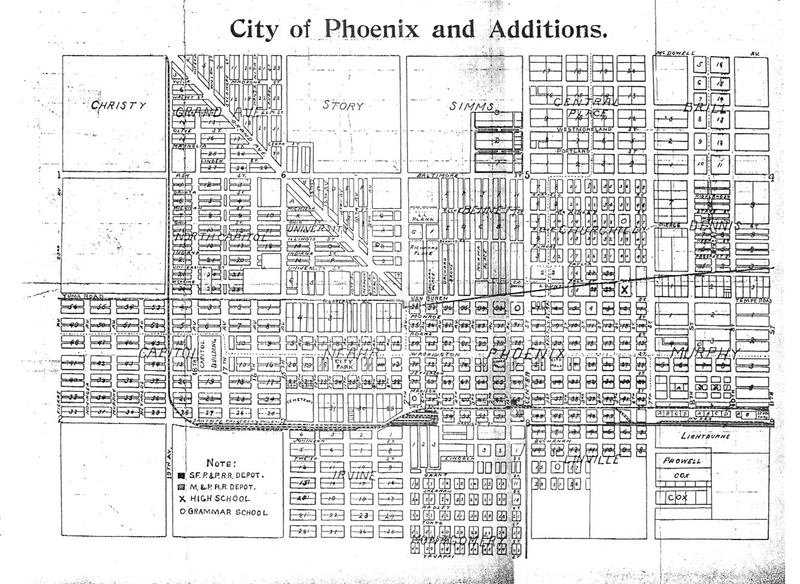 Cities like Glendale and Peoria adopted the names and numbers of the Phoenix grid system, with very few exceptions. For the most part Scottsdale did, too. But it's kind'a fun to find streets that refused to be part of the Phoenix system, for example here in Glendale we refused to use the name Dunlap and instead stuck with the original name of Olive. John T. Dunlap was a mayor of Phoenix, and apparently didn't impress the city of Glendale enough to change the name of Olive. And at 24th Street, the city of Scottsdale and the city of Phoenix didn't agree on what to call where their two streets met, leaving it called Lincoln as it travels east and Glendale as it travels west. This happened in the 1960s, and people who had been using a particular name were not inclined to change it. In spite of the "becomes" (Dunlap becomes Olive, for example), the grid system of the streets of Phoenix is very straight-forward. The grid is oriented north and south, with the exception of Grand Avenue, which is angled northwest at 45 degrees. For drivers who are not used to being on a road that is not north-south, that can be very confusing, but if you look at old maps, you see that it was the direct route from Phoenix to Wickenburg. All of the main streets of the Phoenix, Arizona area, and quite a few half-mile streets, cross the canals at bridges, which is so complete that most people who drive these streets every day have no idea of the complex network of canals that cover the entire valley. The east-west streets have no logical, or alphabetical, system, you just have to memorize them. Some of the names go back to territorial times, and it's too late to change them now. 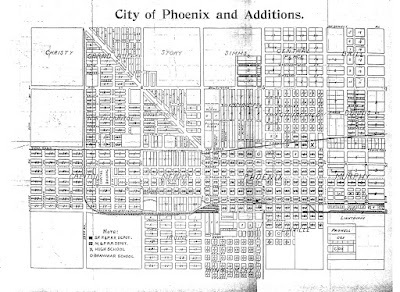 Map above: the City of Phoenix and Additions in 1899. The intersection of Baseline and 91st Avenue is the Initial Point for almost all the property in the State of Arizona. On top of monument hill, which is the hill at turn 4 of Phoenix International Raceway, is the monument that started the survey of Arizona. Baseline Road is named for that survey since it was the Baseline for the division of the lands in Arizona. At one time, it was thought Baseline could be the border between Arizona and Mexico, but that thought passed rather quickly. Grand Avenue started out as the stage coach line and was followed by railroad. People have tried to get rid of it for many years, but people love the convenience of Grand. Downtown are the Presidential Streets. The presidents are centered around Washington. One to the north, one to the south of Washington. They were set in that manner in honor of the president.....Many of the mile streets, east and west, had letters at one time instead of names since they were way out in the country. Lots of local streets had different names when the subdivisions were platted. The names were changed to make names consistent. It is fun to look at the old plats to see the old names. I might as well ask here... Why, in most of the Phoenix area, does the grid system jog to the west a few 100' or so just south of Baseline Road? Hi Travis - thanks for the comment! I'll see if I can find out more. Sounds like you understand this way better than I do! And I only chose Bell Road at random. The grid continues, as you say, all over Arizona, with townships and ranges. I'm still trying to figure all of that stuff out!